lies like truth: Why so much Stein? Why Not? Why so much Stein? Why Not? Gertrude Stein was unkind about the Bay Area. "There is no there there," she once famously said of her home town of Oakland. Nevertheless over the next few months, the region is going to be abuzz with cultural matter centering on the grande dame of 20th century art. With the San Francisco Museum of Modern Art, the Contemporary Jewish Museum and Yerba Buena Center for the Arts all hosting Stein-centric exhibitions, performances, talks, salons and other events, it feels like we're in a Stein Moment. Meanwhile, across the country in New York, the Jewish Museum is presenting an exhibition about the Cone Sisters of Baltimore. They were in Paris at the same time as the Stein Family and were also major collectors of Picasso, Matisse and co. It's sort of weird when all this cultural confluence happens around a single subject or figurehead and there's no obvious reason for it. It's not like there's a Stein anniversary happening this year, which would be the obvious explanation for all the hooplah. A phone conversation with a contact at SFMOMA revealed that coincidence is really the main reason for SteinFest San Francisco. 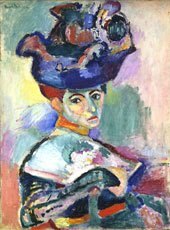 SFMOMA, which holds Matisse's iconic canvas "Femme au Chapeau" in its collection -- a painting which the Stein family bought and championed after its first, controversial showing in Paris -- had been mulling over doing a Stein exhibition ten years ago. Five years ago, the Contemporary Jewish Museum decided that it too wanted to do a Stein show. When the curators there found out that SFMOMA was also planning a Stein exhibition, the organizations, together with YBCA (which is presenting a production of the Virgil Thomson/Gertrude Stein opera Four Saints in Three Acts in August) thought it would be a good thing to go Stein mad at the same time. I'm sure that Stein, who loved abundance, would have approved of this surfeit of attention. And it's sort of fitting for Stein, whose slippery writing so often resists meaning and categorization, to be the cause of a sudden spurt of cultural tribute that is happening just because rather than as a result of a major anniversary or new discovery.